The 2e Division was led General Mermet. The numbers listed are the number of men fielded at the Battle of Fuentes de Oñoro in May 1811. Three quarters of the unit is comprised of Foundry figures. General Mermet's stand has a Front Rank figure representing the General and a Redoubt figure the ADC, it will be eventually replaced by Perry. 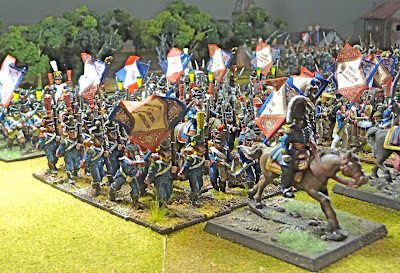 The Redoubts are nasty little figures, but it is what I had at hand when I did the stand. The generals de brigade are a Front Rank on the left and another Redoubt on the right, also to be replaced by a Perry figure in the future. 1e,2e,4e/25e Régiment Légere (1870 men), these are Foundry figures painted about 2 months ago well described in a previous post. 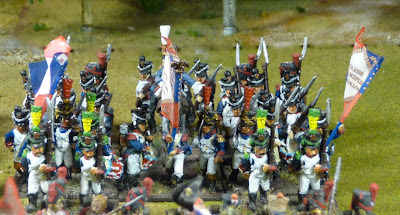 1e,2e,4e/27e Régiment de ligne (1810 men), painted about 3 years ago, it is good to see that you can improve your painting. 1e,2e,4e/50e Regiment de ligne (1410 men). These are of course Victrix. Occasionally I buy painted figures and about 2/3 of this unit was done by Martin Evans. His whites are absolutely stunning as you can see below. My figures of course are the undifferentiated whites, but otherwise I feel they came out well. I still had problems getting the arms glued on straight. 1e,2e,4e/59e Régiment de ligne (1600 men), ditto as the 27e. Well it has been quite a long journey, almost 3 years when I decided to paint a corps each of British and French for this battle. 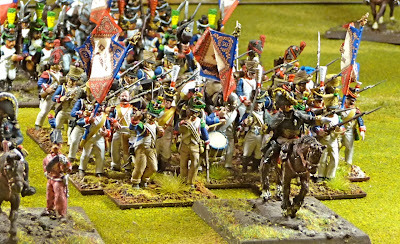 I have 2 more French and 2 more British battalions to paint to complete the goal I had set for myself at the time. I will be happy to move on to some different armies, but I feel I have learned a lot about painting. A great collection, John. I envy your output! Years and years ago I ordered some of the Redoubt Peninsular War figures when they first appeared. Even by the standards of the time, they were...dire! They were soon binned, as I couldn't even find someone who would take them off my hands for free. Thanks Robert, The output is pretty slow, but thanks anyway. I will be happy to get rid of the Redoubts. Well done John, that's quite a collection. I must say you seem to have had a much more consistent approach to building your army - I've tried the same over the years and have also got some rather ordinary figures mixed in with the better makes. For the most part they are disguised well but its a constant evolution of the collection to replace older figures with the newer ones of far better quality. The Perry's and Victrix plastics really help in this endeavour. One always seem to have Lazarus-like older figures that you can't get shot of - dunno why that is, vagaries of the hobby I guess! 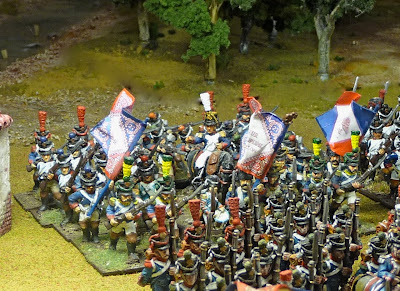 Do you have the artillery and cavalry attached to those corps or just the infantry? Anyway, congratulations on an impressive collection. Thanks Doc, both the cavalry (a very small unit) and the artillery are completed for the 6th corps. I am planning to take a photo of the whole corps, once I finish the first division. I do not mind the older figures, in mass they look fine. Well I am not sure if blending is the word, they are definitely reflective of my changing painting method and skill.